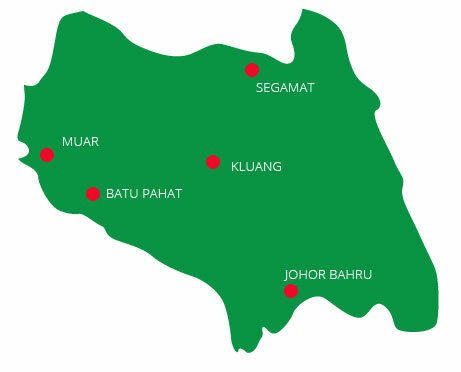 Districts | Federation of Johor Furniture Manufactures and Traders Association. Address No.38, Level 1, Wisma MFA, Taman Tun Dr. Ismail 1, Jalan Bakri, 84000 Muar, Johor, Malaysia. Address No. 65-01 & 67-01, Jalan Mutiara Emas 10/19, Taman Mount Austin, 81100 Johor Bahru, Johor, Malaysia. Address 48A, JALAN KUNDANG 4, TAMAN BUKIT PASIR, 83000 BATU PAHAT. Address 11, TINGKAT 1, JALAN DATO SULAIMAN MD NOOR, KLUANG BARU,86000 KLUANG, JOHOR. Address NO. 15, JALAN BISTARI 1/1, TAMAN YAYASAN, 85010 SEGAMAT, JOHOR.